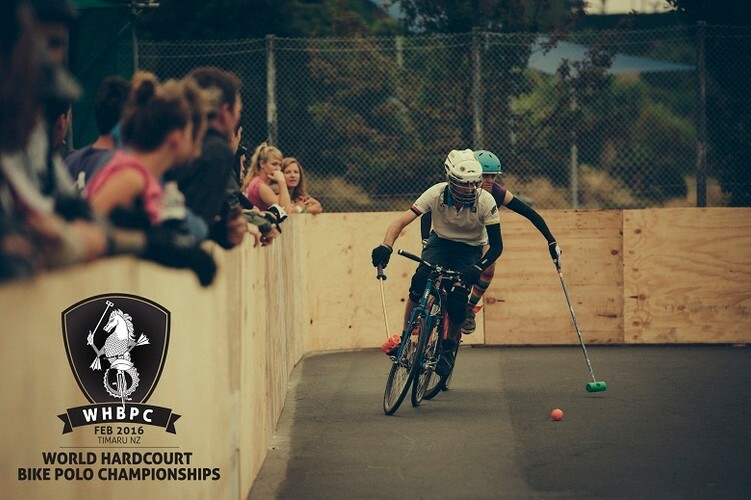 The Seventh World Hardcourt Bike Polo Championships will be held in Timaru, South Canterbury from 1 to 6 February 2016. This championship is the first to be held outside of Europe or North America. The sport is already played in over 450 cities around the world and is rapidly growing in Australasia. The hosting by an Australasian city is in recognition of its expanding global status. Hardcourt Bike Polo is played in teams of 3 people on hard courts with rules similar to ice-hockey. It is gender inclusive (teams can be a mix male and female), it is fast paced and a fantastic spectator sport. Over 300 competitors will participate over six days at The Southern Trust Events Centre, known locally as Aorangi Park. The tournament begins with a wildcard competition; the top eight teams from this competition will join the 40 other pre-qualified teams to play for the world championship title. Pre-qualified teams have gained their place from competing in their home regions within Europe, North America, Central America, South America, Africa, Asia, Australia and New Zealand. Hardcourt Bike Polo was created in the 1990s in Seattle by bike couriers.